A tournament full of surprises but when play concluded in the Men's Singles event on the penultimate day of action, Saturday 18th November, it was the top two names who had booked final places. 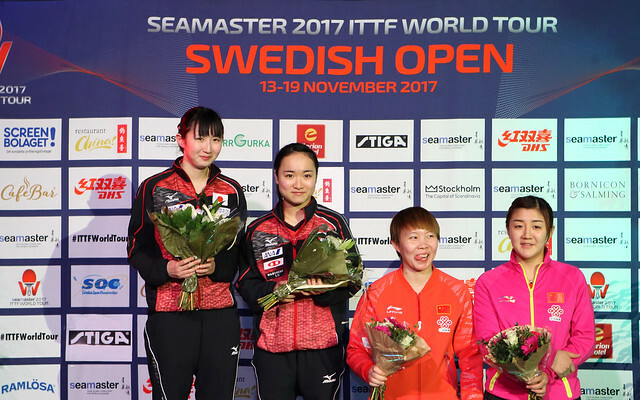 In the penultimate round, all Chinese duels witnessed success for Fan Zhendong, the top seed and Xu Xin, the second seed. Fan Zhendong beat qualifier Zhou Yu (11-6, 3-11, 11-8, 10-12, 12-10, 10-12, 12-10), Xu Xin, the no.2 seed, ended the hopes of Fang Bo, the no.7 seed (11-9, 12-14, 11-5, 11-5, 8-11, 11-1). One of the features of Chinese thinking would appear to favour the concept of taking a “Time Out” relatively early in a contest. Hindsight is wonderful, we are always wiser after the event but the break taken by Fan Zhendong in the fourth game when leading 10-8 and by two games to one was somewhat surprising. Furthermore, the pause did not work in his favour, accepted fortune favoured Zhou Yu but Fan Zhendong lost the next four points! The success gave Zhou Yu a boost, in the fifth game he led 10-6 but then lost the next six points! At 10-8 he called “Time Out” and just as with Fan Zhendong one game earlier, the decision did not work in his favour. He lost the next point before at 10-9 attempting long serve to the Fan Zhendong forehand, he served off the end of the table. At 10-11, he faced game point, once again he attempted to serve long, once again the ball flew long off the end of the table! Moment of charity, in the sixth game Fan Zhendong went ahead 5-3 but Zhou Yu recovered to lead 10-9 and then 11-10; on the second game point he converted, a seventh game was required. At the change if ends in the decider, Zhou Yu led 5-4, he extended the lead to 9-6 but then lost the next four points. He saved the game point but when Fan Zhendong had a second chance he could not repeat the feat. Success for Fan Zhendong was followed by success for Xu Xin. The first two games were close, they were shared; Xu Xin dominated the third and fourth games. Positive, Fang Bo recovered to win the fifth but in the sixth it was one-way traffic. Xu Xin won the first four points, Fang Bo claimed the next point but it was the last he won! Error free Xu Xin won seven in a row, a place in the final was secured. The Men’s Singles final will be the fourth and last match on the closing day schedule; play starts with the Women’s Doubles final at 2.00pm (local time).